One of my 2016 New Year's resolutions is to make use of the wool and fabric I already have. I guess - or rather hope - that everyone who likes to knit and sew knows what I'm talking about. I have lots of wool and fabric at home due to various reasons. Either I bought it at one point in time and never used it or I finished a project and have leftovers. I have already started a series on how to make use of wool leftovers (read part 1 here) and last weekend I decided to start using some of my fabric for a new sewing project. This is how I usually go about a new sewing project: In a first step I find a pattern that I want to implement. The second step is then to go to fabric stores and find the suitable fabric and material for the chosen pattern. This weekend I didn't follow these steps. Instead I took my fabric box out of the cupboard and sorted through it. It surprised me to find fabric I had totally forgotten about. Among others I found a very nice wool fabric suited ideally for a winter dress/skirt. I remember that I received it from my grandmother (she was a professional dressmaker) when she was no longer able to sew herself. I decided to use this fabric for my next project. Once the fabric was chosen, I measured it. I would have loved to sew a dress with long sleeves, but unfortunately I didn't have enough fabric. I guessed that it is enough, however, for a skirt. 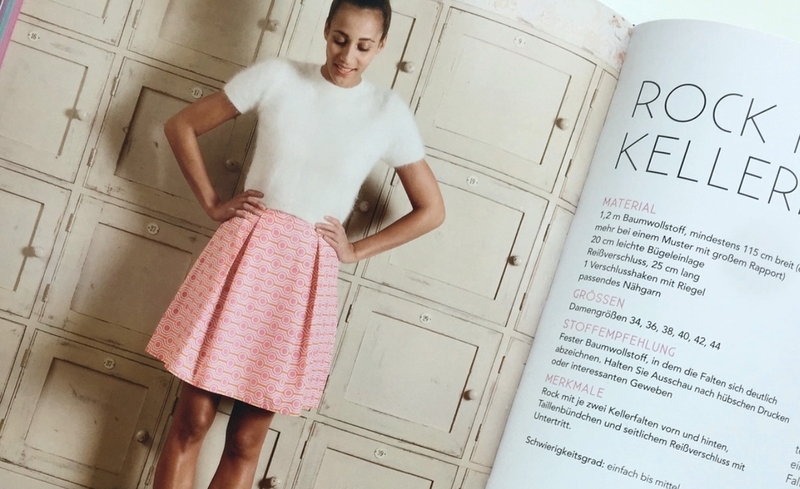 I then flipped through my sewing books and magazines, searching for a suitable skirt pattern. I soon found it in one of my new books "Geschickt eingefädelt - Das grosse Nähbuch". The book was released based on a new TV show created in Germany. So finally I had my fabric, the pattern for a nice box-pleated skirt and luckily also a matching thread and some soft interlining needed for the waistband. Everything ready to start sewing and I didn't even spend any money! The pattern is quite easy, the most difficult part is to sew in the hidden zipper. Other than that it is very straight forward and the book even provides detailed tipps with images for certain parts if needed (e.g. the zipper or folding the box bleats). I really like the outcome and will definitely wear this skirt soon. Also, I'm already looking forward to searching through my fabric box(es) to find more treasures to use for new projects.